The largest bank which lets Somalis in the US send money back home is due to close this service, raising fears for the famine-hit country. Sunrise Community Banks said it would halt the money transfers to comply with US laws on financing terror groups. US-based Somalis are believed to send about $100m back home each year - largely from Minnesota. The Somali government estimates that annual remittances are $2bn - about one-third of the country's income. It has urged Sunrise to delay its 30 December deadline for closing the accounts of the Minnesota-based Somali money transfer businesses, known as "hawala". After two decades of warfare, there is no formal banking system in Somalia. Some Minnesota-based ethnic Somalis have been accused of raising money and recruiting fighters for al-Shabab, a Somali militant group linked to al-Qaeda, although Sunrise denies its decision is linked to any recent convictions, reports the Reuters news agency. Minnesota is believed to be home to some 60-80,000 ethnic Somalis. Aid agencies including Oxfam America and the American Refugee Committee (ARC) have urged the US government and the banks to find a way of keeping the service open. "This is the worst time for this service to stop. Any gaps with remittance flows in the middle of the famine could be disastrous," said Shannon Scribner, Oxfam America's Humanitarian Policy Manager. "The US government should give assurances to the bank that there will be no legal ramifications of providing this service to Somalis in need." US-based Somali Dahir Gibril told the BBC's Network Africa programme that he sends about $100 a month to keep his family and other relations alive in Somalia. "I don't know what's going to happen but they could die of starvation," he said. Said Sheikh Abdi from the ARC said a few small banks elsewhere in the US still let Somali money-transfer businesses send cash but he thought they would soon follow Sunrise's lead. Somalia has been worst affected by East Africa's most severe drought in 60 years. Al-Shabab refuses to let many international aid agencies operate in the many southern and central areas it controls. It says they have a political agenda and are exaggerating the scale of the suffering. 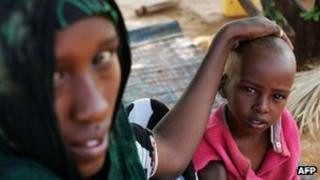 The UN has declared a famine in three areas and aid workers say it is the world's worst humanitarian disaster.